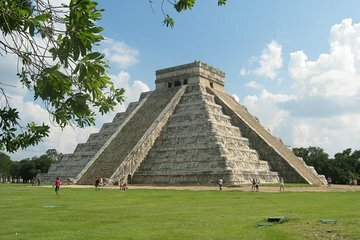 Faites une excursion d'une journée à Chichen Itza, l'un des sites culturels les plus sacrés et les plus importants du Mexique. Le site du patrimoine mondial de l'UNESCO est divisé en trois zones de ruines, et vous les verrez tous sur cette visite complète avec un guide privé. Voir l'Observatoire, Great Ball Court et Great Plaza, et bien sûr, la grande pyramide de Kukulcan, nommée l'une des sept nouvelles merveilles du monde. Après la visite, déjeuner dans un restaurant local avant le retour à Mérida. We were picked up at our hotel and driven to the site. Chichen Itza is hot and crowded. The tour guide took us from one structure to the next, stood in front of it and droned on in Spanish and marginal English with rather tedious information. The guide pressed us to buy trinkets from one particular vendor there were many. The tour was very tiring and near the end we left the guide and went to the restaurant for a lemonade to wait for departure. At the end of the tour, the guide then took us to a cenote. This was not mentioned in the tour information, we had not prepared for it with bathing suits or adequate funds, and we wanted to return to our hotel. Instead we had to sit in the sun and watch the tour guide counting his kickbacks. This tour is difficult to review. As one of the seven wonders of the world, one is pretty much obligated to see it if in the area. I would recommend finding an alternate route to the site, arming oneself with information, and walking around on ones own. Guide and driver were very accommodating and flexible. One suggestion is having a video playing while en-route to location giving backgroud and other information in case you hadn't had time to read up on the site.